This article explores the factors you need to consider with regards to human behaviour when carrying out your Fire Risk Assessment. Under the Regulatory Reform (Fire Safety Order) 2005, the responsible person must ensure a suitable and sufficient fire risk assessment is carried out. When carrying out this task, the assessor must not only consider issues such as ignition sources, causes of fire spread, active and passive protection, fire alarm systems, emergency lighting etc but they must consider how the occupants are likely to react when the alarm is raised. There is no point in the assessor ensuring travel distances strictly comply with the various codes and then when the fire alarm operates everyone just sits there. I have been involved in the fire safety industry for many years and indeed deliver fire safety training courses at all levels. In my experience of all the fire risk assessments I have seen rarely do you see any mention of how the occupants are likely to react to any fire alarm and indeed what you can do to speed up this reaction to ensure prompt evacuation. 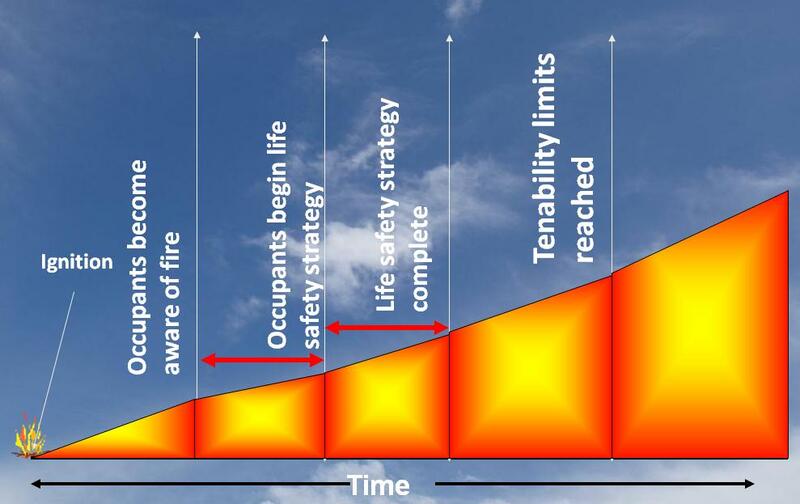 Previous high profile fires such as the Woolworths fire in Manchester when 10 people died highlighted the importance of good management in order to reduce the pre-movement time of occupants. When a fire alarm operates in a public building, how do the general public react? They generally do not run out of the building but instead look around to try and get more information. They generally ask themselves, is it a test? Is it a false alarm? This is further compounded when the staff are untrained and carry on serving customers. If the public see the staff ignoring a fire alarm, they will! BS9999 allows you to increase travel distances when it can be demonstrated that you can reduce the pre-movement time by early warning for example along with demonstrating good management. 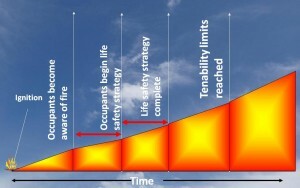 This is the time between occupants becoming aware of the fire and the occupants beginning the life safety strategy. Do people die in fires because they panic? Well what is a definition of panic? It is “an overwhelming feeling of fear and anxiety”. The notion that people will act as inanimate objects running to exits is questioned by social scientists who accept that delay is the main factor that contributes to death in large scale fires. 2. The fire alarm sirens cannot always be relied upon to prompt people to immediately move to safety. 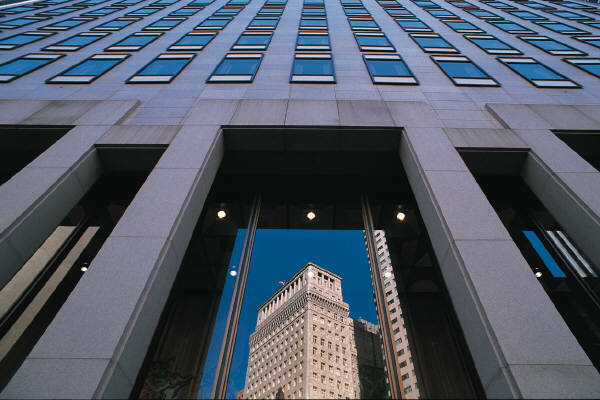 People in public buildings assume nearly ALL fire alarms are false alarms or fire drills. 5. 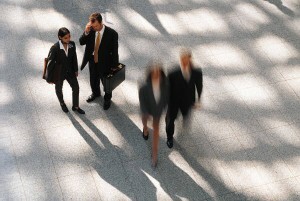 As long as an exit is not seriously obstructed, people have a tendency to move to familiar exits. People like to go out the way they came in.! This has become apparent when carrying out fire drills in colleges for example. The management has been critical about the width of the front entrance not being wide enough but this is due to ALL the occupants heading for the main entrance rather than going to the nearest exit. You could argue that in public buildings if all the occupants are likely to go to the main entrance, then this should be wide enough to accommodate all of them. This principle is recognised by many fire engineers and indeed incorporated into fire engineered strategies. The research also found that when an exit was visible in front of them that 70% of people went to this exit not the way they came in. This was increased to 100% when the lecturer on operation of the fire alarm instructed people to go to this exit. They also found that the reaction time was significantly reduced when they could see where the exit was. Where should you locate a Crèche in a building? Well if you consider that the parents are likely to head for the main entrance when the fire alarm goes off, this is where you should consider locating it. 8. People are often prepared to try and move through smoke, especially if visibility over 10m. This is considered in fire engineering strategies for tenability and indeed is a key parameter in justifying extended travel distances in buildings. 9. Peoples ability to move towards exits may vary considerably (e.g. young fit adult and elderly or disabled person). This is why all risk assessors must consider people with disabilities and carry out either Personal Emergency Evacuation Plans (PEEPs) or Generic Emergency Evacuation Plans (GEEPs). These are the 9 factors considered to create the model of human behaviour. Human behaviour in fires can also have an effect on evacuation from high rise buildings. In Sao Paolo 1972 a serious fire resulted in 300 people being evacuated from the roof by helicopters and it was heavily publicised on all TV news channels. 2 years later another high rise fire in same city and many people did not try and evacuate but went straight to the roof. However, the problem was that the roof was much smaller and helicopters could not gain access. This resulted in 90 people losing their lives and all because of people remembering a similar incident. In conclusion, human behaviour in fires must be considered and their likely reactions to an alarm operation for example. You should consider what you can do to ensure a prompt and safe evacuation from buildings. Installing a voice alarm system for example should reduce the evacuation time from many public buildings and carrying out frequent fire drills with well trained staff is essential if the evacuation is to be successful. This article was previously published in the RICS Journal.